It's time for my second desert island beauty post and this time it's the turn of skincare. If you haven't read my desert island make-up post you can find that one here. 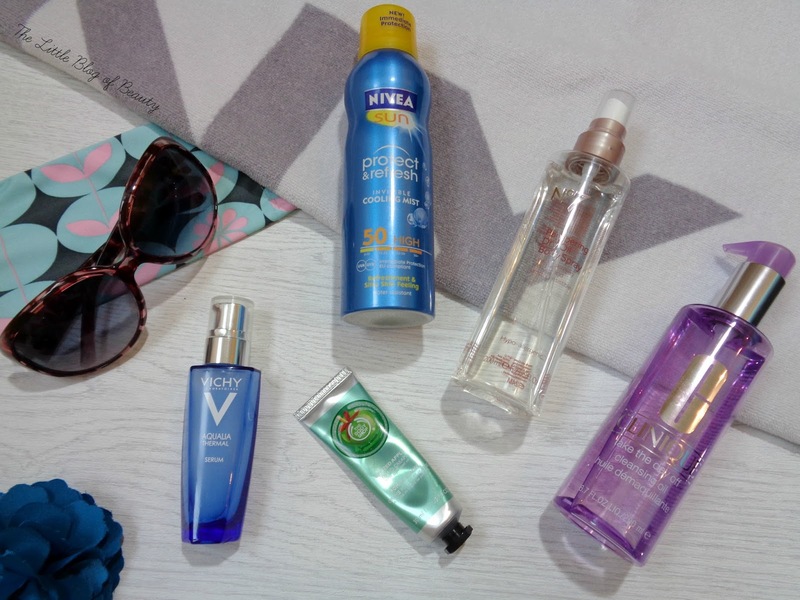 So as well as having time to grab sun glasses and a towel and pick the five make-up products I want to swim to shore with I also had time to pick five skincare products. Choosing my make-up was quite easy but this one really was difficult because I use so many different skincare products on my face and different areas of my body. I'm not completely sure I've picked the right products, for a start I've realised I don't have a lip balm and I'm not sure I can live without one (not an exaggeration), but these are the products I went for. If you're shipwrecked on a desert island then there's no question that if you had any choice you would make sure that you had a good sun protection cream with you. My current favourite is the Nivea Sun Protect & Refresh and I go for factor 50 because I want to protect my skin as much as possible and I burn easily. This one is actually a couple of years old now so will need chucking, but I'm hoping they still do this one so I can pick up a new one in the summer. The spray makes it handy to apply and it does feel cooling on the skin. It absorbs quickly and leaves my skin minimally sticky/tacky, if at all. 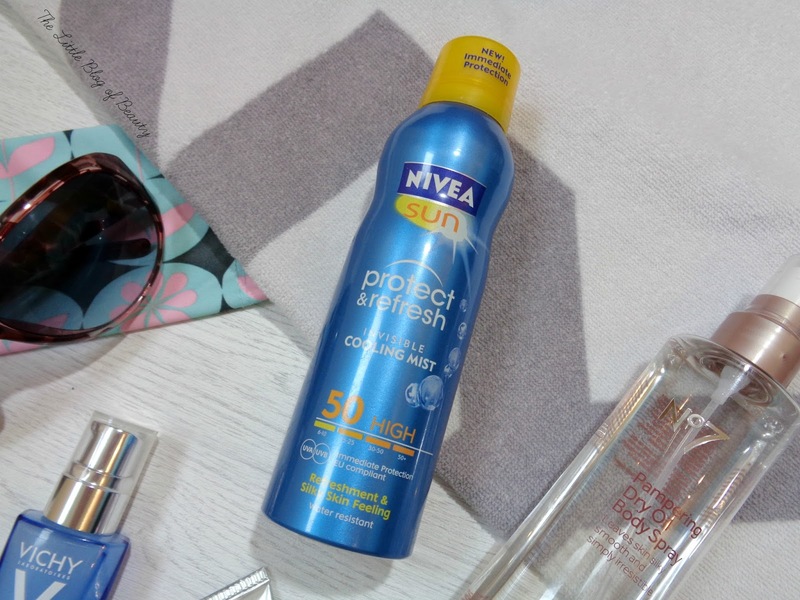 Being stuck on a desert island I wouldn't mind being slightly tacky from my sun cream but at home when wearing my everyday clothes I hate the stickiness you can be left with after applying sun protection. I do use a separate sun protection cream for my face but as I can only chose five products I would make do with using this on my face as well (and hope for the best). After being in the sun so much your skin is going to need some moisture and I've decided to take the No7 Pampering dry oil body spray. Although I do like body oils I tend to prefer body lotions, but there's just something about this one I really like. It has a lovely spa like scent and is easy to apply as it's in spray form. It absorbs quickly and leaves my skin feeling soft, smooth and moisturised. I guess I could have just used this on my hands but as they really can get dry, especially the skin around my nails, I decided to take a hand cream and of course picked my favourite little The Body Shop hand creams. This one is the Christmas limited edition Glazed apple scent, which you obviously can't get now, but they have plenty of lovely scents to chose from all year round. When it comes to my face there were two things I definitely wanted to be able to do, one being cleanse away all that sweat, salt and sun lotion and the other being get some moisture in my skin. I was trying to decide between a cream or oil cleanser but in the end settled on an oil one to really melt all that dirt and grime away. I chose my current favourite which is the Clinique Take the day off cleansing oil. I possibly slightly prefer the Vichy Micellar cleansing oil over this one but I don't currently have a bottle of that! I also had to decide what sort moisturising product would be best for my face and settled on a moisturising serum. A serum is absorbed deep into the skin, moisturising as it goes, so if you can only use one product on dry/dehydrated skin this is probably the one to go for. Although it's not quite my favourite I'm currently using the Vichy Aqualia Thermal Dynamic Hydration Power serum, so that would be the one that would currently go with me. What would your desert island skincare products be?